Even just being out looking at properties, it is sweltering out there! So we thought it’s a good time to share some information that everyone can use regardless if you’re out house hunting for a rent-to-own home or not. Heat-related illnesses can cause serious injury and even death if unattended. Signs of heat-related illnesses include nausea, dizziness, flushed or pale skin, heavy sweating and headaches. Victims of heat-related illness should be moved to a cool place, given cool water to drink and ice packs or cool wet cloths should be applied to the skin. If a victim refuses water, vomits or loses consciousness, call 9-1-1 or your local emergency number immediately. Drink water. Carry water with you and drink continuously even if you do not feel thirsty. Avoid alcohol and caffeine, which dehydrate the body. Eat small meals. Avoid high-protein foods, which increase metabolic heat. Avoid strenuous activity. If you must do strenuous activity, do it during the coolest part of the day. Stay indoors when possible. If air-conditioning is not available, stay on the lowest floor out of the sun. Heat cramps: Heat cramps are muscular pains and spasms due to heavy exertion, they are an early signal that the body is having trouble with the heat. Heat exhaustion: Typically occurs when people exercise heavily or work in a hot, humid place where body fluids are lost through heavy sweating. Signals of heat exhaustion include cool, moist, pale flushed or red skin; heavy sweating; headache; nausea or vomiting; dizziness; and exhaustion. Body temperature will be near normal. 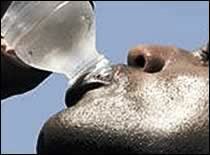 Heat stroke: Heat stroke is life-threatening. Signals include hot, red and dry skin; changes in consciousness; rapid, weak pulse; and rapid, shallow breathing. Body temperature can be very high—sometimes as high as 105 degrees.. The body temperature can rise so high that brain damage and death may result if the body is not cooled quickly. NEVER leave anyone or any pet in a closed, parked vehicle.